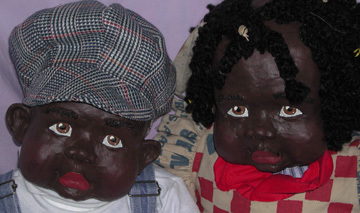 please allow at least 4-6 weeks creation time... since each piece is custom made and hand painted. Marge is at it again!!!! Santa has oh so many many letters to read...and he has fallen asleep from exhauston. Mrs Santa is likewize asleep from her busy work as Santa's helpmate. Their trusty dog "MistleToe" is oblivious to all their dither and is pretending he is a Christmas tree. 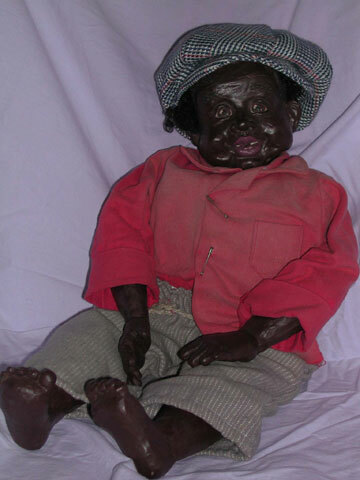 Tree limbs are attached to his head with a shawl and trimmed with tiny jingle bells. This adorable set can be personalized by adding the names of all your family members on the blank pile of letters stacked at Santa's feet. A wonderful keepsale you will treasure in years to come. $35.00 for the Mrs. and $35.00 for the Santa. The dog is $22.50. The shipping is $6.50 per piece or $12.50 max. 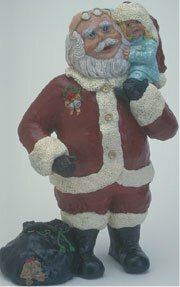 The santa pieces are about 5" high and 5" wide. Please Email Marge to check availability before ordering this Santa set. Stoppers in base bottle are....Bacchus, Lucas, Cleetus, & Callie. Stoppers resting in front row are.... Cleetus & Willie. You know, it's tough to beat a glass of fine wine...especially when you've a friend to share the pleasure. 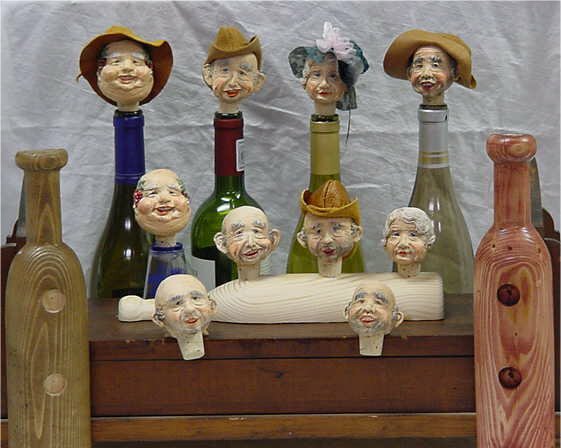 Meet my "friend" wine stoppers which are both functional and entertaining collectable conversation pieces. These stoppers are completely handmade by Marge Crunkleton...from the tips of their noses to the tops of their little real leather hats. The bottle stopper heads are $29.50 each without leather hat. Add $5.00 for each hat. 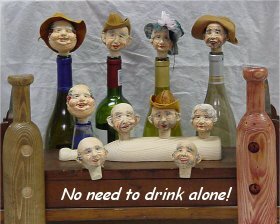 The wooden bottle base is hand turned on a lathe exclusively for my bottle stoppers and sells for $12.50 per base. Each base holds three bottle stoppers. They will be stained a light oak color. or Email me now to place your order! 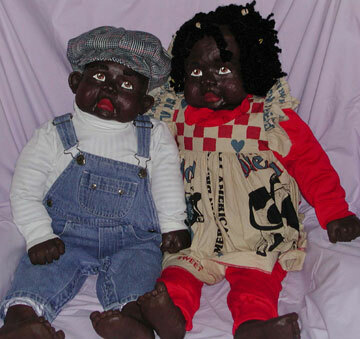 Marge's Babies Are they cute or what? They are $15.00 each. "Teensy" is the one laying down and is 2 1/2 inches long. 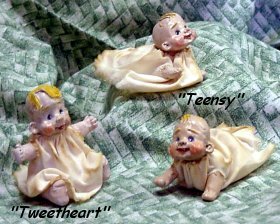 "Tweetheart" is the sitting one and is about 2 inches high. They are tea died and completely handmade by me, Marge Crunkleton! Resting on a wash tub, Aunt Mimmie wipes sweat from her brow with one hand... and holds a fly swatter with the other hand. 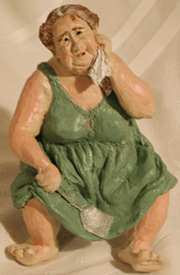 Sculpted, cast in wood resin from my exclusive molds,hand-painted, and signed by me, Marge Crunkleton. Samantha ia about 27" tall. Classic Santa holding wish list with a toddler on his shoulders. Santa stands approx. 14" tall. Sculpted, cast in wood resin from my exclusive molds, hand-painted, numbered and signed by me, Marge Crunkleton. Santa is a limited edition of only 600 pieces. To make each piece more SPECIAL, Marge is going to hand personalize each Santa with a Looooonnng List of names that are near and dear to you! 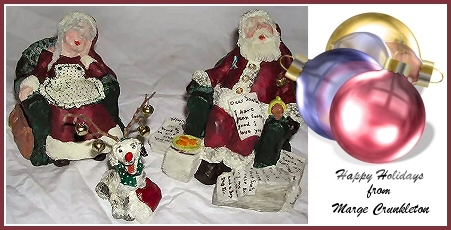 Please look for an email from Marge soon after purchasing, to make these SPECIAL ARRANGEMENTS for your Santa.